The Next 36 2013 Hackathon wrapped up over the weekend with over 140 undergraduate students wired up on Red Bull, coffee and wearable tech. The Waterloo and Toronto Google offices hosted the event. The hackathon not only showcased the entrepreneurial and developer talent coming out of the universities but also highlighted the major role Canadians are playing in the wearable hardware space. Teams were asked to develop software for hardware in the first wearable computing hackathon of its kind in the country, and were given just over 24-hours to do it. The event gave teams direct access to devices from major heavy weights in wearable tech including Pebble’s smartwatch, Thalmic Labs’ gesture-control armband MYO and the internet-enabled wearable sensor from Kiwi Wearables. All three of these devices have strong Canadian roots and continue to make headlines as disruptive innovations set to change the way we interact with technology. Although not a Canadian company, Pebble’s CEO and founder Eric Migicovsky is a University of Waterloo and VeloCity incubator alumni. Pebble, of course, has already achieved its “disruptive” status. The smartwatch maker achieved the status of most successful crowdfunding project on Kickstarter, having raised over $10 million dollars in 2012. It arguably paved the road for other smartwatches, by creating a massively successful smartwatch (albeit not the first). Kitchener-Waterloo startup Thalmic Labs is gearing up to launch the device we have all been waiting for since seeing Tom Cruise in Minority Report. The muscle activity and motion sensing armband MYO is definitely one wearable which can safely be called a “game-changer” if it meets its expectations when it hits the market. Two of Thalmic’s team memebers, Stephen Lake and Scott Greenberg, also happen to be The Next 36 alumni. A newcomer to the wearable scene, Toronto-based startup Kiwi Wearables, aims to make single-function wearable devices a thing of the past. The hardware device and cloud-based platform allows developers to create a wide-range of experiences based on motion, from turning on your TV to tracking your activity while playing sports. The team just got back from TechCrunch’s Disrupt Hackathon and is gearing up for their crowdfunding campaign set to launch later this month. For both Kiwi and Thalmic, providing access to their devices at this event was a big deal since both are still in development. In fact, this was the very first time that the MYO had ever been brought out of the Thalmic labs in Waterloo. In speaking with many of the teams at the hackathon in Toronto, getting access to devices that were not yet on the market was one of the major draws of this event. Pre-production access doesn’t come without its hiccups. Many of the teams found the biggest challenge through out the night was working through hardware issues. Although the MYO and Kiwi’s potential was clearly illustrated at the event, it was also clear that there is still some work to do yet on these devices before they are ready to hit the market. Sports, music, and security applications were the common software themes coming out of the hackathon. In Waterloo, first place went to Team Llamatom who used the MYO to build an app that could lock or unlock devices using gesture. The first place winner in Toronto was given to Team Rocket who built a real-time sports feedback app using Kiwi Wearables. Team Rocket was made up of six undergrads from University of Toronto and Waterloo. The team’s concept was to track the motion of a user practicing a sport using the Kiwi and measure their performance in real-time to alert them as to how close they were to optimal movement. The team simplified their feedback to users by using a traffic light colour system to help them immediately understand when their motion was on track, close or way off. The winning team may have had an advantage since one of their key members, University of Toronto Electrical and Computer Engineering student James Schuback, is an experienced developer in wearable technology. Schuback developed for Google Glass while participating in a two-month business and entrepreneurship program in San Francisco. For Schuback, the key to developing a successful app for wearables is in the use of the data collected, something that was clear from the app he and his team built at the hack. “At the end of the day, if you want to do something unique you have to have the right algorithms underneath to analyze the motion data and make it in to something meaningful,” said Schuback. 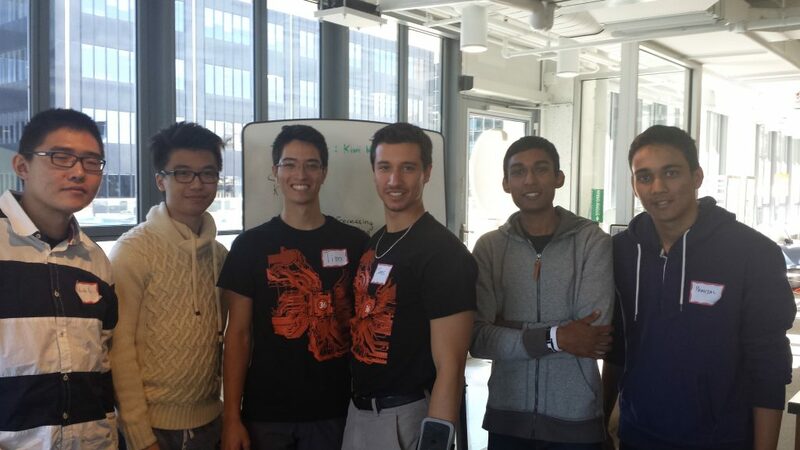 The top teams from both the Toronto and Waterloo hackathon walked away with a set of team MYOs when they come out on the market in 2014 as well as a cash prize. But the real prize for the first place teams is advanced spots at The Next 36 Selection Weekend in late November.